Sunny spells and a slight breeze gave us a perfect track. Todd and guest Jason Garrity lead from the tapes in heat 1. Ludwig picks off Jason out of turn 4 to go second, and then does the same to pass Todd at the same place on lap 2. Jason belies his bRough Park expertise as he surrenders third place to Tero Aarnio on the last bend. Carl Wilkinson leads the way in heat 2 from hard pushing James while Ashley is untroubled by Jack who is struggling to come to terms with the track. Impressive from James on his first visit to bRough Park. Michael Palm Toft leads the way in heat 3 with Charles on his heels waiting for a mistake. The mistake comes from Jack at the back of the field who falls and the race is awarded. Lasse is the meat in a Diamond sandwich and loses a chain before the first bend of heat 4. James leads from Ashley with Lewis nursing a sick motor. James makes the slightest error on the last bend and Ashley is poised waiting to take advantage. Jason off gate 4 swoops around the field to lead down the back straight in heat 5 and wins in the fastest time of the season. Todd does enough to stay ahead of Matthew and the Tigers take their first heat advantage, but the Diamonds now lead by six points. 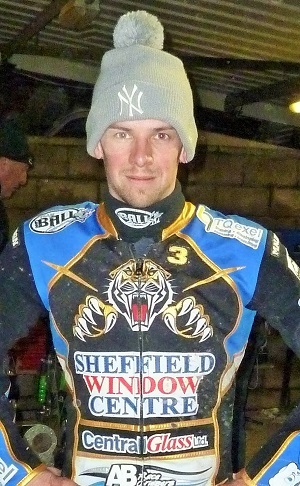 Simon Stead wastes no time in giving Jason a tactical substitute ride in place of Jack in heat 6. Disaster as Lasse cannot get his bike running and is excluded under the time-to-track rule. James takes his place and follows Jason home for a Sheffield maximum heat win with Ludwig passing Tero at the start of lap 3 and hard on James heels at the finish. Lewis wins heat 7 from the tapes with Charles experimenting with wider lines and just staying ahead of Carl. Jack just cannot come to terms with the track as rider replacement. The Diamonds trap in heat 8 but James steams into turn 3 with a pass in mind, but bales out rather than collecting Ashley and quickly clears the track for which he is congratulated by Mr Breckon. Jamesis back out again in heat 9, but Lasse again fails to get farther than the second bend, although he sits for four laps with the engine running before leaving the track under power. Charles off gate 4 rounds the field to lead out of turn two but hits the fence and is passed by Tero down the back straight. Charles blasts high and wide around turns one and two on the second lap to retake the lead, but at the same time Todd loses third place to Ludwig leaving the Diamonds 12 points ahead at the interval. We'll see how Ashley performs when the first green sheets are published and he's swapped his No.7 jacket for the No.1. In the meantime we desperately need a replacement for Josh before the league starts with Peterborough home and Glasgow away.